Week 26 – finally a frost! This warm fall has decided it is finally time for some cold temps. What does that do to the veggies? Those that are hardy enough to stick around in the ground get a bit sweeter as they make more sugars in their cells as a sort of anti-freeze. Do you notice the difference in the greens and the carrots this week? The storage veggies (winter squash, onions, garlic) don’t notice the cold because they are safe inside, except the potatoes which are still being dug from underground – but they are insulated by the soil. The soil temperature is much more constant than the air temperature and takes a long time to cool down. Around here I don’t think it usually gets much below 45 degrees a few inches down even in the coldest part of winter. This helps root crops like carrots and parsnips store in the ground through the cold season. If their tops are exposed to the air though, you can expect some rot to eventually set in after some heavy freezes. One way to avoid this is to hill up the tops with soil, or use a floating row cover. OK enough farmer talk, what’s in the share? Braising mustard mix (a mix of a few different kinds of mustard greens), fingerling potatoes, “candystick dessert” delicata winter squash (the sweetest winter squash ever – you can literally have it baked with nothing on it and it’s quite sweet), one other assorted winter squash of your choice, a green chicory (either escarole or “castlefranco” radicchio), carrots, cippolini onions, various other onions, garlic, and celeriac (celery root). The Candystick Dessert delicata squash is a variety bred by Carol Deppe, a gardener, plant breeder, author, and homesteader who lives near Corvallis. She likens the flavor to that of a Medjool date. Let me know what you think. Try cutting in half, scraping out the seed cavity, and baking face down with a little bit of water on the pan at 375 for 15-20 minutes. They don’t take very long. Delicata can also be cut into 1/2 wide U-shaped pieces and pan fried skin and all. I understand the “delicata” name to be referencing the fact that the skin is delicate enough to eat. 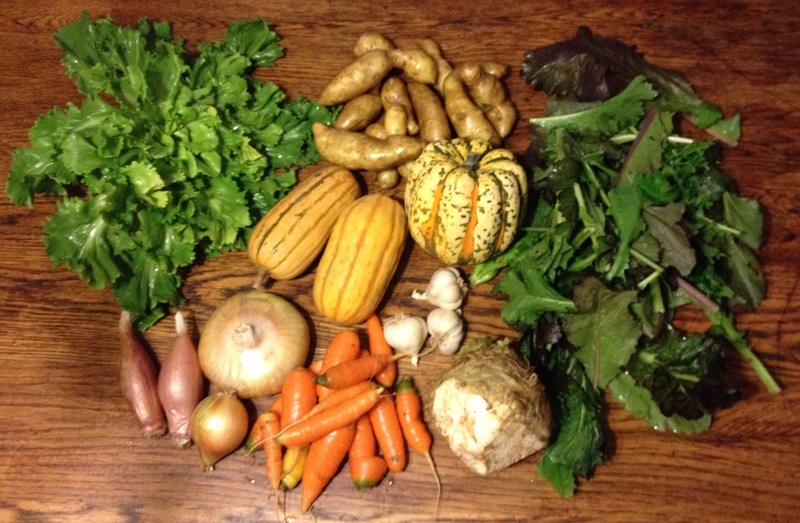 One more CSA pickup this year! Get ready for beets, butternut squash, leeks, collard greens, shallots, and more next week! May you eat well until then. — Matt. This entry was posted in csa and tagged Carol Deppe, carrots, csa, Cully Neighborhood Farm Cully Collective Market Farmer's Market, Farm, portland, winter squash. Bookmark the permalink.